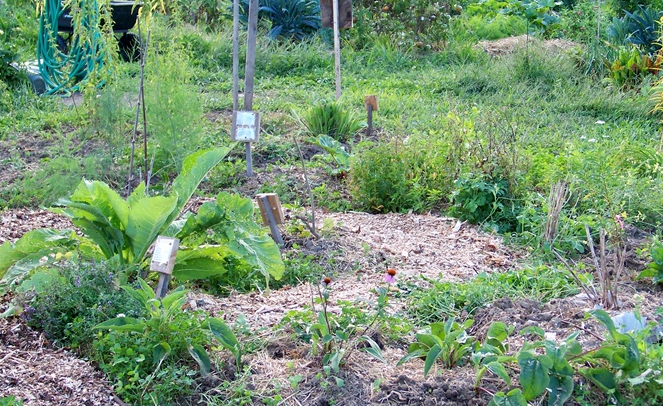 Community Gardens & Farms - Help Yourself - Public Access Food Forests in Mass. In Sept. '12, HYS donated a few dozen shrubs and trees of the 100 or so plants that went in at the new 800' edible hedgerow at FOG - native fruits like serviceberry and nannyberry (a banana-tasting fruit with medicinal bark) goji berry, plus medicines and wildlife habitat like witch hazel and pagoda dogwood. In April 2013, we donated 6 fruit trees to some of the small picnic spaces around the garden: a 'Green Gage', 'Stanley' and native plum, a 'Szukis' persimmon grafted at Tripple Brook, a 'Sunhaven' peach, and a 'Lapin' cherry. 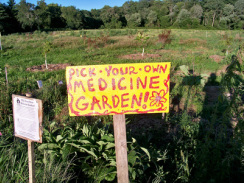 Pick-Your-Own Medicine Garden: This 20x40' plot is next to the nut groves near the cow pasture. Folks can harvest herbs, berries and plant divisions from along the spiral paths. Here's a video of Dean explaining the project. Come harvest solomon's seal, nettles, wetlands and rugosa rose, yarrow, black and 'John's' elderberry, comfrey, asparagus, rhubarb lemon balm, peppermint, grapefruit mint, oregano, walking onion, chives, bee balm, violet, horehound, catnip, sage, thyme, motherwort, boneset, pokeweed, mullein, milkweed, and more! A dozen beach plums, hawthorne, highbush cranberry and black haw are in here, growing up until they're big and strong for transplanting elsewhere. Feel free to take divisions and leaves from the abundant, spreading perennials. Please leave roots and don't disturb slow growing, woody plants. 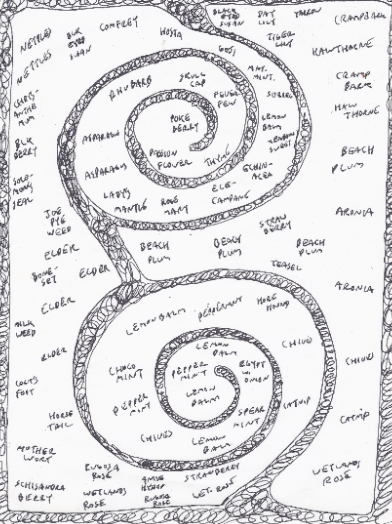 Here's a map of the spiral to help you find what you're looking for. Can you spot tiger lily, elder, and clover? 6/13: 1 'Stanely' self pollinating dwarf plum tree to the Master Gardener demonstration plot at NCG, and hope do donate more trees over time, do some pruning, grafting and guilding work. A project of the Just Roots organization, home to summer programs, educational walks and workshops, demonstration gardens, community medicine gardens, farm festivals and more. 5/13: 1 Breda Giant Medlar, 3 Asian pears (hosui, kosui, shinsui), 4 Apples (William's pride, winesap), 5 Chinese chestnut, 6 black walnut. 5/13: 10 native plums, 1 nannyberry, 2 beach plums, 2 black currants, and 5 apples: 1 Mutsu, 1 MacFree and 3 Freedom at the Hancock St. Garden. The plums will be transplanted to nearby Tyler St. community garden as they grow. Overhanging fences, fruit will be pickable for passersby along the sidewalk, and supports this program with fruit for sale and educational opportunities. We also did a wild edibles presentation at the Mason Sq. Farmer's market. BBF grows edible mushrooms, vegetables, sheep and more in Montague. Its many acres host the teaching gardens for the Clearpath School of Herbal Medicine, as well as wilderness used weekly by Wolf Tree Programs as well as Full Moon Girls, both nature awareness programs for youth. 6/13: 4 Asian pears (chojuro, shinseiki), 2 American plum planted by the nature programs on the farm land, to be enjoyed by the many children who connect with their wild sides in that space, their families, and staff. Next Barn Over is a vegetable CSA on Route 47 in Hadley. This spring, we planted a public access, free to pick, native fruit and nut PYO hedgerow along their road frontage, and southern property line for screening. There will be parking for the PYO available. Featured plants will be hazels, black walnuts, mulberries, persimmons, elder and American plums.